Scenic Truc Lam Tay Thien Zen Monastery is breathing new life into Viet Nam’s cradle of Buddhism. Trung Hieu has the story. Vinh Phuc, Vietnam -- It was a hot afternoon at the end of June. Heat that brings sweat to your forehead at the very thought of going outside, especially when outside means streams of motorbikes and people jostling each other as they are about their daily business. But we were on our way to somewhere quite different, winding out of the summer haze up a mountainous slope through the pine forests of Dai Dinh Commune, Tam Dao District, in the northern province of Vinh Phuc. To our left, the Tam Dao Mountain Range swooped across the horizon, casting majestic shadows on the quiet villages underneath. Already we felt at peace even though all we could see of our goal – the recently built Truc Lam Tay Thien Zen Monastery – were the red tips of its tile-covered roof, peeking at us from a distance through the trees. Soon, after climbing up dozens of stone steps, we stood in front of the Zen Monastery’s Three-door Gate. Looking back, far away, the sun burned down on the harvested rice fields. We were gasping for breath but the fresh cool air, sharpened slightly by the bitter-sweet scent of pine needles, quickly revived us. The Truc Lam Tay Thien Zen Monastery was built on the ruins of an ancient pagoda named Thien An Thien Tu and part of the pagoda’s floor still remains. Before construction, the provincial Culture and Information Department in co-ordination with the Viet Nam Museum for History excavated relics from the Ly and Tran dynasties (between the 10th-15th century). According to local history, since the time of the first kings of Viet Nam, the Hung Kings, in Tay Thien region, there have been three pagodas called Thien An Thien Tu, Thien Quang Thien Tu and Hoa Long Thien Tu erected in the area. The name ‘Thien Tu’ means Zen Pagoda, so experts on Buddhism have concluded that this branch of Buddhism has been present in Viet Nam since that time. It’s a significant heritage that’s not just about bricks, according to Zen Master Thich Thanh Tu, a leader at Truc Lam Zen School in Da Lat. The leader says the most important goal in constructing the Truc Lam Tay Thien Zen Monastery is honouring the values of Buddhism in Tay Thien region. Work began on the site on April 4, 2004, and on August 31, a celebration officially marked construction of the Dai Hung Great Temple. After 15 months, work was complete and the Truc Lam Tay Thien Zen Monastery was officially inaugurated on November 27, 2005. 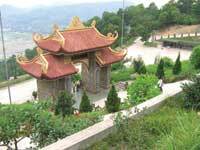 Its Dai Hung Great Temple is indeed great; 17m high and covering an area of 673.2sq.m (20,4 x 33m). But it’s size can only really be appreciated from inside as four big pillars stretch through the airy space to support the roof. The layout is uncluttered save three Buddhist statues standing on the altar. The Most Venerable Thich Kien Nguyet explains that monks wish to promote simplicity in tune with the Monastery’s motto for leading a religious life: "Buddha is in our hearts, so there’s little need for rules or material offerings." But for the work that adorns the temple, craftsmen from famous handicraft villages were invited to participate in the construction. Stone sculptors from Non Nuoc Village in Da Nang carved the Buddha statues out of sa thach (sandstone), stone that was similarly employed by ancient Egyptian and Cham people because its softness makes it easy to carve and its durability means sculptures can survive for thousands of years. More workers from Ninh Van stone-carving villlage in the northern province of Ninh Binh contributed with stone lamps, incense burners, pillars, steles and parallel sentences (writing sometimes carved in wood, hung on two pillars on either side of the altar). But stone sculptors weren’t the only people cutting it for the monastry. Carpenters from Ha Tay and Vinh Phuc provinces were employed to build altars and the 6m-long wood panels on which parallel sentences are carved. Bronze casters from Hue City got a piece of the action as they cast a two-tonne bell for the Monastry. But reviving doesn’t mean reconstruction as Zen Master Thich Thanh Tu, founder of the Zen Monastery, comments: "Regarding the architectural aspect, the Truc Lam Tay Thien Zen Monastery is a Vietnamese pagoda of the 21st century, not a pagoda of the 16-17th centuries." For Zen Master Thich Thanh Tu, building the monastry on this site will regenerate the area’s ancient bond with the ancient religion. According to the history of Buddhism in Viet Nam, Tay Thien is considered one of its founding lands, thanks to Indian monks who carried out missionary work here 2,300 years ago. "Building a Zen monastery in Tay Thien will remind people in the country and the world that in the year 300 BC, a delegation of Indian monks and an Indian princess arrived in the region to build a pagoda and do missionary work. "Therefore we have built the Zen Monastery named Tay Thien (‘India’ in ancient Vietnamese) to record and honour the acts of these people." And there’s a more tangible element too, as construction of the monastry will pave the way for further research into the history of Buddhism in the area, he says. Walking around the buildings, you can almost taste the tranquillity and calm that’s in the air. You can see it in the faces of the 30 or so monks and 20 nuns that live in the monastery. Most Venerable Thich Thong Van says: "Humans must have a belief; when we honour Buddha, we are like Buddha." We left the monastery at sundown. With a last glance back, we saw the monastery bathed in a fading sunset, gradually hidden from our view in the gently waving tree tops. But the feeling of peace lingered. When we reached the foot of the hill we still felt as if we were up in the clouds. One visitor from Ha Noi, Pham Vinh Ha, says she believes that the Zen Monastery, along with the province’s Tam Dao tourism site, will help create a place renowned for its scenic beauty both in the province in particular and the country. "Like a bright gem in the forest, the Zen Monastery will attract visitors not just for its beautiful scenery but for its cultural and spiritual importance too," she says.